Our students shone at Thang Ta Martial Art Nationals which was held at Haryana Rohtak from 28 March to 30 March. The event was organized by Thang Ta Federation of Haryana under the aegis of Thang Ta Federation of India. The students had been trained under the watchful and expert eye of Miss Unjuman Farooq who is herself a national award winning Thang Ta player. The school secured three medals in the event. 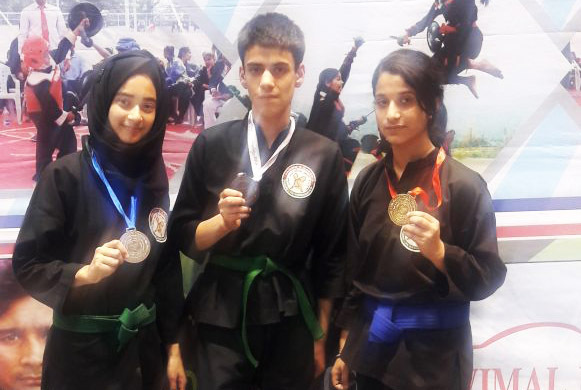 Sairah zahoor won the gold medal, while Shariba won the silver medal and Bariq won the bronze medal. Speaking on the occasion Miss Unjuman Farooq said “The wins again highlight the quality of our training program. At DPS, we ensure that the students are identified for potential, and groomed to shine in the field.” The Chairman Mr. Vijay Dhar also expressed his delight at the rich haul, and noted it as a vindication of the school’s attempts to establish a sporting culture to offset the gloom of circumstances.